MediaLab, a leader in online laboratory software, offers an online competency assessment creation and delivery system. POCT Compass helps your point of care coordinators deliver custom competency assessments to hundreds or thousands of POCT employees, track their completion and corrective action, and present a complete picture of your POCT competency assessment program at any time. Create custom competency profiles for each instrument, test, or platform in use. Build online courses, online checklists, procedure reviews, and review of quality control records, observations of instrument maintenance, and more. POCT Compass includes ready-to-use competency assessment modules for many popular instruments and PPM tests. Assign competency profiles to your employees and allow POCT Compass to automatically deliver initial, six-month, and annual assessments, on schedule. Best of all, POCT Compass correlates all of your competency activities to the appropriate CLIA assessment procedure, so you can see instantly validate that you are covering each requirement. Administration features: POCCs have administrator access to create, assign, deliver, and track competency assessments. Additional administrators can include nurse educators, managers, etc. No limit to number of admins permitted in the POCT Compass system. Configuration of user type is covered during initial setup. Admins can mark activity completions, such as observation checklists, proficiency testing, blind duplicate studies, etc. Admins can query reports to easily observe complete, incomplete, and overdue activities for all users, a single user, or a group of users in real-time. User features: POCT device users will have unique logins with a Home/To-Do page containing their current assigned competency assessment activities. 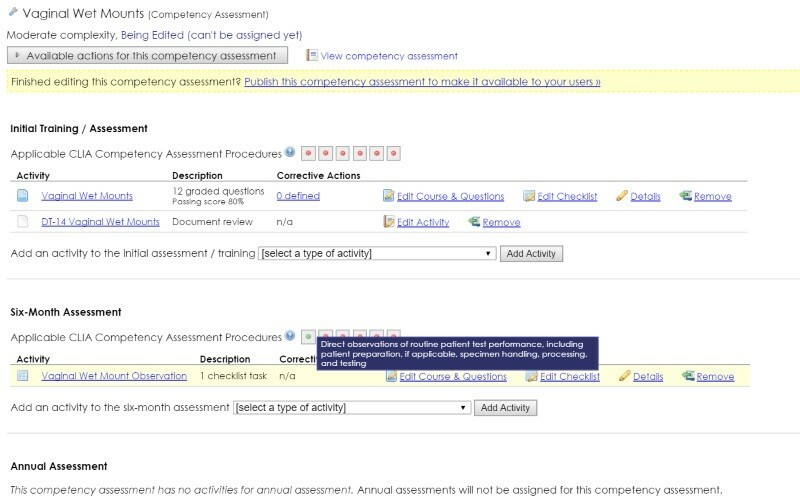 Previously completed competency assessment activities are listed and viewable for each device (competency history). Users can complete checklists with their observer, take online courses with competency quizzes, and more. Users received email notifications from POCT Compass whenever new assignments are made or upcoming competency assessment activities are approaching their due dates. Reporting features: Robust and customizable reports are achieved in the “Reports” tab of the POCT Compass program. Examples of reports can include: overdue reports, incomplete reports, completed competency assessment activity reports, or any combination thereof. Reports can be queried for one user, a group of users, multiple groups of users, or all facility users. Reports are sortable by instrument or group or name. Reports can be exported to Excel, saved as PDF, or printed in real-time. Installed base: Over 3,000 MediaLab facility subscribers. Hospital or laboratory combinations include POCT Compass, Compliance & CE, Document Control, and/or InspectionProof. No installation required. No hardware to install or software to download. POCT Compass is 100% cloud-based. No facility IT department involvement required.